A range of electrical wiring centres for UnderFloor Heating and Wall Hung Radiator manifold systems. EWC-1 unit is available in 8 ways, 230V or 24V and includes circuit indicators, on/off switch and boiler/pump terminals. EWC-2 unit is available in 8 and 12 ways and 230V with pump/boiler terminals and system operational LED. The new EWC-4 is a 4 way wiring centre designed for smaller systems, complete with pump/boiler connections. All wiring centres include time switch terminals to allow central time control of multiple zones. 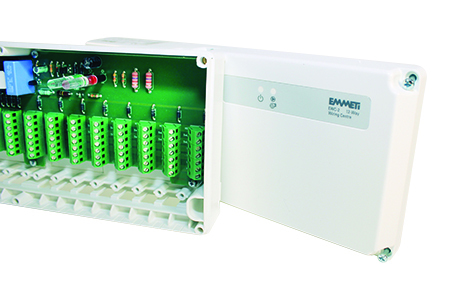 The Emmeti EWC-1, 8 way wiring centre available in 230V and 24V version designed to allow central electrical control of wall hung radiator and underfloor heating systems. Each heating zone can be controlled independently via the 8 channels. Pump 230V output terminals with a 2.5 minute time delayed relay which allows the electrothermic heads to open before energising the manifold pump. For further technical and installation details please refer to the ‘downloads’ section below. 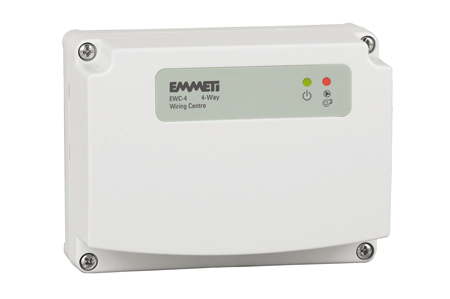 The Emmeti EWC-2 is a more commercially priced wiring centre available in 8 way and 12 way, 230V versions. Designed to allow central electrical control of wall hung radiator and underfloor heating systems. 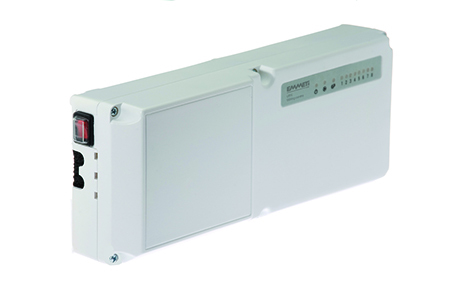 Each heating zone can be controlled independently via the 8 or 12 channels. LED indication for boiler/pump operation. Will boiler interlock terminals on the wiring centre accept 240V? Yes, as they are volt free. How do I connect a boiler to the EWC wiring centres? This applies to both 230V and 24V EWC-1 wiring centres: 230V boilers - Link terminals L2 ('pump') and NA ('boiler'). Terminal C ('boiler') can then be connected to the boiler switched live terminal. Low voltage (e.g. 24V) boilers - Take the low voltage output from the boiler and connect to NA on the wiring centre. Terminal C can then be connected to the low voltage input terminal to energise the boiler. On a 24V EWC-1 underfloor wiring centre, can 230V be connected to the boiler ‘volt free’ terminals NA & C.? The terminals will accept either a 230V or low voltage live supply. Under no circumstances must a 230V neutral and live both be connected to these terminals as this will cause a short circuit and may damage the EWC-1. Where can I obtain a spare fuse for EWC-1 wiring centre? Emmeti UK can supply 8A fuse for 230V and 24V wiring centres – product code U9360050 and, 4A fuse for 24V wiring centre - product code U9360040. What size wiring / cable do I need for connecting thermostats to an Emmeti EWC wiring centre as part of an underfloor heating system? How do I connect the UFH wiring centre to a Y Plan central heating system? Can you connect more than one actuator per channel to an underfloor wiring centre? Yes, you can connect up to 5 electrothermic heads (actuators) per channel on an EWC-1 or EWC-2 and 4 heads per channel on an EWC-4. Can you provide .dwg drawings of your wiring centres? Yes, they are available please ring or email with your request, we will provide it. Can I have a wiring diagram for an S plan central heating system with an UFH wiring centre? Can Cat5 cable be used for connecting the thermostats on the 24V wiring centre? Yes, Cat5 cable can be used, provided they are not so long as to cause an unacceptable voltage drop below the level of the thermostats (24V-10%). Cat5 must not be run in the same vicinity as mains cable. Can I extend the sensor cables provided with your thermostats? Yes, although the cross sectional area of the cable must not be less than the original sensor cable and not so long as to affect the NTC resistance. We would recommend 0.5mm2 up to a maximum length of 25m Sensor cables must be run away from mains cables to avoid interference.